Today author Elizabeth Wein is visiting our book review club to chat about her brilliant new novel, Rose Under Fire, the companion book to Code Name Verity. CNV topped my list of best books of 2012 and won the Printz Honor award for young adult fiction. I expect her latest will be another crossover success with readers of all ages. 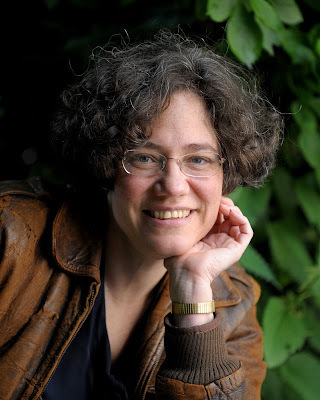 Elizabeth Wein's lyrical prose soars and hits all of its targets. Fans of CNV will be pleased to hear that Rose Under Fire features another World War II girl pilot and some old friends: Maddie, Jamie and the morally ambiguous Anna Engel. Although I'd advise reading CNV first for backstory, Rose Under Fire is a stand alone book with literary weight of its own. The story is broader in historical scope and also darker. Read with a box of tissues. Summary: Rose Justice graduated early from high school in the USA so she could help the war effort in the UK. Raised on her father's airstrip, she is already an accomplished pilot, but women are given domestic air transport duty. Her British uncle pulls strings to get her assigned to a trans-channel flight. A jubilant Rose wings the Eiffel Tower in recently freed France. On the flight home, she vanishes. 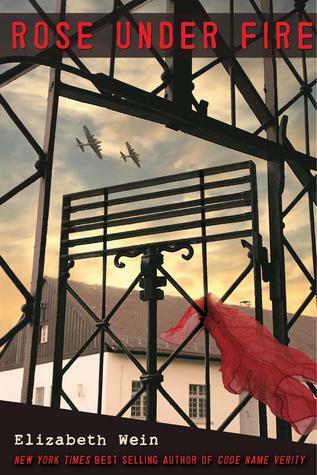 Rose's story of her time in a women's concentration camp is told in survivor flashbacks interlaced with poetry. 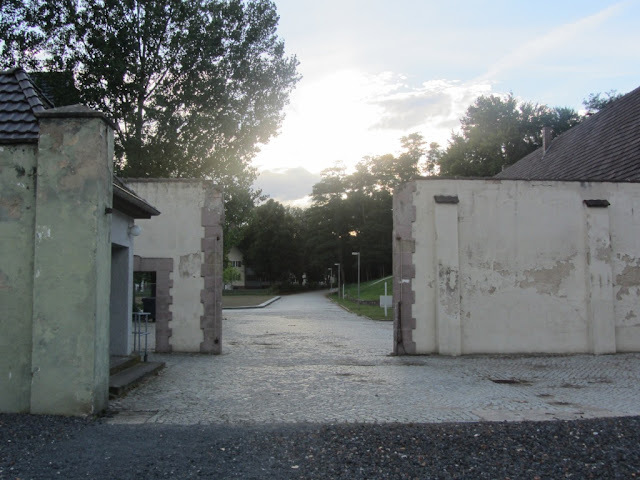 The former Ravensbrück Concentration Camp in Germany, photo by Elizabeth Wein. Ravensbrück is a grim setting, but the defiant will of the prisoners and their camaraderie make for an uplifting story. My favorite was Irina, the Russian fighter pilot, who crafts model planes out of junk. There were so many strong female characters. However, the horrors of concentration camp life were not glossed over. Rose is beaten, hungry and cold, but she brings hope to her fellow prisoners by exchanging poetry for bread. Like the poetic mouse in Leo Lionni's Frederick's Fables, Rose shares recollections of happier times: good food, bright nail polish and a charming boyfriend. Through Rose, history is humanized. We feel her pain and share her dreams. "Hope - you think of hope as a bright thing, a strong thing, sustaining. But it's not. It's the opposite. It's simply this: lumps of stale bread stuck down your shirt." Rose's suffering is put in perspective when she befriends the teenaged girls and women in her cell. The Poles were used as experimental "Rabbits" by Nazi doctors. These rebellious Rabbits are anything but meek victims. They smuggle out messages to the world, but people can't believe such atrocities are true. Although the characters were fictional, they were based on real people and on survivor accounts. Thanks to Elizabeth, a new generation will learn about the Polish Rabbits. Rose Under Fire was released in the UK this summer and will be available in the USA on September 10th, 2013. I'd highly recommend this book to mature teens and to adults. It would make for meaningful book group and classroom discussions. I have a personal interest in this period of history. My great grandfather, Arthur Lamport, helped 750 Jews escape Nazi Germany and set them up on farms in the Dominican Republic. 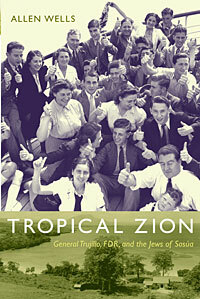 You can read about this true story in Tropical Zion by Allen Wells (2009). Going back a bit further in history, my British grandfather-in-law, Colin Laurence, was a World War I fighter pilot. He was shot down while trying to bomb a German U-Boat base and was imprisoned in Holtzminden. Despite his head injury, Colin and his fellow prisoners tunneled out, were recaptured and then escaped a second time. This week those brave men (now deceased) are being honored in Germany. We named our first child after our family heroes. Reviewer's Disclaimer: My father gave me a copy of Tropical Zion. Author/Professor Allen Wells teaches at Bowdoin College with my husband. I received a free digital galley of Rose Under Fire from Netgalley. Photos supplied by Elizabeth Wein and reproduced with her permission. Sarah: What made you decide to focus on the Polish experimental “rabbits” of Ravensbrück? Elizabeth: I didn’t know about the “Rabbits” myself until I started reading survivor accounts, and when I discovered that their rebellion took place during the time when Rose was going to be at Ravensbrück, I knew that it was their story I wanted to tell. I’d wanted to write about Ravensbrück partly because it was a way for me to cameo several different women’s wartime roles from all over Europe: arrested university professor, terrorist Girl Scout, Soviet combat pilot. But when I found out about the Rabbits, I knew that this story was going to provide the framework for a real plot, not just a series of incidents. Were there really terrorist girl scouts like Roz'a in Poland? Why did you tell the story via an American survivor’s flashbacks? I used an American voice to tell this story because I wanted to drive home how ordinary so many of these people were—how like us. I think that often gets lost in historical accounts. There were in fact a few Americans at Ravensbrück, though not many; I’ve got some information about them on my website, here. As for the flashbacks, no survivor accounts are told “in real time.” I wanted this to sound like an authentic survivor account. I was also very impressed with Wanda Poltawska's And I Am Afraid of My Dreams, which she initially wrote in three weeks after the war was over, not long after her return home from Ravensbrueck. A friend had suggested that if she wrote down her experiences it might help her to get through her PTSD. That's where I got the idea for how Rose's story should be told. 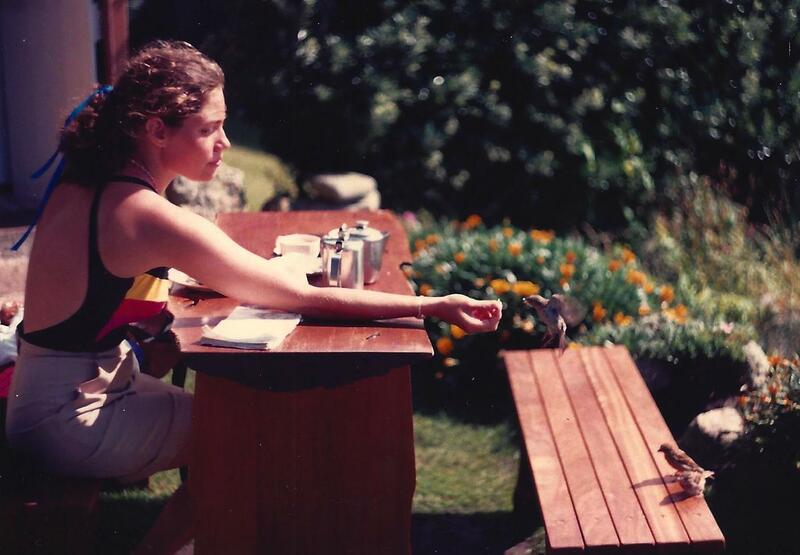 Elizabeth Wein at Rose's age living in England. Photo by Katherine Kirkpatrick. "Time cannot break the bird's wing from the bird. Can die as others do." The narrative voice was convincingly authentic, and the dialogue sounded true to both the time period and the various nationalities of your characters. You're an American living in the Scotland. Do you share Rose’s Pennsylvania Dutch (ie. German American) background? Ha ha, you’ve found me out! Yes, I drew very much on my own background—and my grandmother’s—for creating Rose. It is really the first time I’ve ever done this. Not only did I use the Pennsylvania Dutch background as a cultural reference point, but I actually set Rose’s hometown in my grandmother’s hometown—Mt. Jericho is Lebanon, PA, and Conewago Grove is Mount Gretna. I also have a specific airfield in mind for Justice Field—Reigle Field in Campbelltown, where I got my American pilot’s license. It is still family owned and first opened as a civilian airfield in the early 1940s. How did you research the other characters for authentic voice? As for the other characters, it felt kind of cheesy to try to give them accents. So instead I had Rose make the excuse of “I’m going to write it the way I remember it, not the way she said it.” One of my linguistic tricks is simply to construct correct English sentences for non-native English-speaking characters using the syntax of their own language. It’s not too difficult for me to do this in French or German, but I’m not a Polish speaker. One thing I learned about the Polish language is that there’s no definite article. So I tried to avoid my Polish characters using definite articles when they’re speaking. With Irina, the Russian character, I just kept her statements very short and tried to limit her nouns and verbs—not because she’s Russian, but because she’s communicating with Rose in a language that neither of them speaks very well (French). The flying sequences in your books take the reader along for an exhilarating ride. What motivated you to get a pilot’s license? My husband had a pilot’s license when I met him. We did a lot of our courting on trips to exotic (?) places in small planes (the Kenyan coast, the Isles of Scilly, Kalamazoo). One of our dreams—still a dream—was to fly across the U.S.A. But we figured we’d both need to be able to fly for such an epic journey. 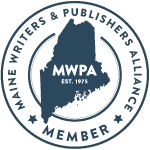 I used the advance from my second book, A Coalition of Lions, to pay for my flight training! Elizabeth Wein with her flight instructor Montse Mas Arcos and a friend by a Piper Warrior (PA-28). Did you fly your narrative routes? Most of my own flight experience has been in Scotland, so Maddie’s flight to Scotland was definitely based on that, but most of my “small plane” experience over Southern England and the English Channel has been as a passenger. For big “narrative routes” like Maddie’s flight to France and Rose’s flight to Germany, I plotted the routes on a map—as though I were planning to fly them myself. I “flew” Rose’s flight to Germany via Google Earth, which is where I got the idea of having her first see Ravensbrück from the air—I “virtually” saw it for the first time the same way. Maddie’s experience of being shot at in the air, and her difficulties in controlling the Lysander afterward, were based on real Moon Squadron incidents described in We Landed by Moonlight by Hugh Verity. For more about how I researched some of the flight scenes in Rose Under Fire, take a look at my website here. Your books are beautifully written. Can you describe your writing and editing process? Were any of your beta readers teenagers? My daughter Sara was a beta reader at 14 (she's now 16) - she handed the ms. around to several friends in her class who were already fans of Code Name Verity. She's one of those who connected more easily with Rose Under Fire than with Code Name Verity, and prefers it. It's one of only two books that have made her cry - the other is Bridge to Terabithia by Katherine Paterson, so I feel like I'm in excellent company! What roles do your agent and your editor play in revision? My agent (Ginger Clark) is not an editorial agent but she does occasionally give me broad suggestions. Most of the revision is done with the UK and US editors. Other than the covers, are there differences between the British and American editions of your books? There are slight differences between the US and UK versions, but I’ve had total control over that (I’m bilingual in English and English!) Rose Under Fire was put together by the same team as Code Name Verity. As a writer, I know how an author lives in the world she/he is creating for months or years. Emotionally, how did you cope? With Code Name Verity, very badly! I was an emotional wreck the whole time I was writing it and for three weeks after I’d finished. With Rose Under Fire, it was more subtle; I kept ruining everyday objects and foods and items of clothing by referring to them in the book. So now I can’t see a red bathing suit without wanting to weep, or wear stripes (I can’t abide stripes any more), or see the brand name Siemens (which is everywhere! On CCTV cameras on our street! On my grandmother’s hearing aid!) without shuddering. It’s like having a mild form of PTSD. It really is. Incidentally, I did a bit of poking around on the Siemens website when I was trying to find out more information about their factory at Ravensbrück, and I was very impressed with their company history. They do an excellent, honest job of not glossing over the ugly part of the story while still maintaining pride in their present company. “Don’t get it right, get it written.” That’s James Thurber, but I first heard it from my friend and erstwhile writing partner Elizabeth Tyler, whose father used to say it. Will you write about flying again? Can you share something about your next book? I will and I am! But I don’t feel I can talk too much about my next book because it’s so unfinished and is subject to major changes. It’s set in Ethiopia in 1935 and there will be flying in it. Your first young adult series was set in Ethiopia too; what drew you to that location? What initially drew me to Ethiopia was that my aunt and uncle were in the Peace Corps there from 1968 to 1970, so I had a family connection. My uncle was the one who first told me about the ancient Ethiopian kingdom of Aksum, which is the setting for four of my previous books. I love the idea of revisiting this setting in a more recent era, but it's extremely challenging. Fascinating! I can't wait to read your next book. Thanks so much for your tremendous support and interest in my books—it’s a delight to be able to share some of the inside secrets behind their creation! Thanks for joining us, Elizabeth, and best of luck on your international book tour! You know I don't usually read YA fiction anymore, but I might have to make an exception in this case, Sarah. This sounds like a fascinating book with interesting characters and a story that young adult readers should hear. However, I've read several books in recent months set in part during WWII and involving the Nazis. I can only read so much of this before I start getting depressed, so it will be awhile before I want to read something in this setting again. As always, I enjoy your author interviews--so interesting to read the background and the process Wein went through in writing this novel. I am eagerly awaiting my copy of this book--I LOVED Code Name Verity and am confident this one will be just as excellent. I'll have to carve out a time to read it. CNV was so intense that I was slightly disoriented trying to read it in snatches amid daily life. I read Unbroken by Laura Hillenbrand this summer and was overwhelmed. That period holds as much human triumph as it does tragedy. Will come back later to read this. A most interesting review and one that uncovers a piece of history of which I was unaware. I really enjoyed your post. Many thanks. Very interesting subject and good review and interview. You should be so proud of your ancestors! What a terrific interview! I love how Wein has brought attention to what women were doing in WWII. I'd love to read a story about terrorist Girl Scouts, I must say. "Rose Under Fire" is a book I must read. Wonderful interview Sarah and the pictures are great also. I really like that Rose shared poetry for bread. Rose, these books could just as easily been published in adult historical fiction. Like you, I need a break with lighter books in between WWII books. I’d love to hear your reaction. Alyssa, I loved Hillenbrand’s debut Seabiscuit. Do let me know what you think of ROSE. ACIL, I had heard about the Nazi experiments but not how they targeted Polish women. Linda and Margie, thank you – I am indeed awed by my ancestors. Liviania, the terrorist girl scout in ROSE is a feisty character. So nice to connect with another book blogger! Another fantastic interview, Sarah! And kudos to Ms. Wein for such frank and comprehensive answers. CNV has been on my TBR list for too long, and now I'll have to add Rose! Sarah, these war time based stories usually share desperation as well as courage and hope and there is enormous strength in it. I love the quote about hope being not something shining you can look up to but something disgusting that will help you. Such a wise statement. And I really enjoyed the interview letting us take a look behind the scenes. In Czech we use the expression "to be an experimental rabbit" when something new is tried. Another superb review, Sarah. The concept of terrorist girl scouts alone is enough for a book premise - and I love the Thurber quote about writing. How fascinating to learn about the heroic members of your family and their roles in both world wars. I love reading your reviews and interviews, Sarah. You put so much work and energy into them, they practically breathe! One of my clients was wondering about a good YA book to buy for her daughter's friend who is an avid reader. I will recommend Ms. Wein's series and might have to try them myself. All, I’ve updated the post to include the Edna St. Vincent Millay epitaph to ROSE, which matches the bird photo so well. Ellen, W2W thanks! You’ll love her books. Troutbirder, Amanda, thanks for the feedback! Petra, how interesting to find colloquial overlaps in Polish and Czech! This sounds wonderful, Sarah, albeit an emotional read. I will give this book (and a link to your review) to my sister for Christmas. She loves to read and is fascinated with the Holocaust. I enjoyed the author interview. It's always interesting to hear another author's tricks of the trade. Thank you! Barrie, thanks for hosting the book club! ROSE doesn’t focus on the holocaust, although it is mentioned. Ravensbrück was for mostly non-Jewish female prisoners. Still, it your sister is interested in WWII atrocities, she should read this book. Thanks for stopping by, everybody, and thanks, Sarah, for hosting this interview which is one of my favorites! You asked great questions. Hope new readers enjoy the book!